We’d love your help. Let us know what’s wrong with this preview of The Brain's Way of Healing by Norman Doidge. In The Brain That Changes Itself, Norman Doidge described the most important breakthrough in our understanding of the brain in four hundred years: the discovery that the brain can change its own structure and func Now a New York Times Bestseller! To ask other readers questions about The Brain's Way of Healing, please sign up. Anything in here on gut issues/IBS/Chron's etc? Does it include experiences with exposure to dolphins' ability to sense human imbalances through their sonar and correct imbalances through their touch? This is the fascinating story of a Toronto neurologist psychiatrist who travels the world fawning over sorcerers and con artists. Doidge front loads the book with his strongest cases of neuroplasticity, to lure you in, but each successive chapter retreats further from reason and evidence, until you're learning about a wizard who can heal nearly any mental or physical ailment you can name by shining LED lights at you. I think Doidge means well, and I am down with bleeding-edge science. The trick This is the fascinating story of a Toronto neurologist psychiatrist who travels the world fawning over sorcerers and con artists. I think Doidge means well, and I am down with bleeding-edge science. The trick is to carefully qualify each therapy and be crystal clear about the limits of what we know. Instead, Doidge spends considerable energy dressing up the most far-fetched anecdotes to make them easier to swallow. Sometimes he seems to be trying to convince himself as much as you. There are a few significant red flags. Doidge waxes on and on about acupuncture meridian points, explaining that they haven't changed for thousands of years (a textbook argument from antiquity). I kept waiting for the paragraph qualifying that the weight of evidence shows that it doesn't matter where you stick acupuncture needles, or even *if* you stick them. It's nothing but a placebo. Doidge either isn't familiar with the research, or he's constructed one hell of a blindspot for himself. I'm guessing the latter. He also buries in the end notes his belief that autism and vaccines have a causal relationship. From a doctor engaging in public education, this is inexcusable. To review this book, I have to tell you about my grandmother. When I bought my house, I was thirty years old and single - with little apparent prospect of that changing (not that I hadn't tried to get married, but all the women I'd asked to marry me - some of whom I even knew - had refused). However, my grandmother, my little Italian Nonna, was living with my parents, ten minutes walk away. It was, as the marketing men say, a no brainer: I asked her to move in with me. May I say that there is no m To review this book, I have to tell you about my grandmother. May I say that there is no more cushy or comfortable life, for a thirtysomething single male, than having your Italian grandmother living with you. Washing, cooking, cleaning, dusting, ironing, sewing - it was all done. Just so you don't get too jealous of the tempting, mouth watering delights that must have been served up to me each night, I must say that the one area in which Nonna was not all Italian was cooking: she was terrible. Well, maybe that's slightly too strong a word: her risotto and lasagne were good, but out of her two dish comfort zone, things tended to get, well, slabby: I still remember with a slight shudder the thick slices of deep fried polenta, quivering like vulcanised yellow rubber, that she served up at least once a week. But in all other respects, it was a wonderfully cushy life - and it meant I really got to know my Nonna (particularly as she had only recently moved to England). It was a glorious interlude, and one that lasted four years. But then, I got married (I sprang the proposal on my wife so completely out of the blue that she didn't have time to dodge). Nonna moved out. Wife moved in. Nonna went back to my parents, taking over many of the housekeeping duties there, while always, whatever the weather, taking a daily constitutional through the park. Then she had a stroke. A little one. Some weakness in her left arm, a limp, soon recovered from, and half an aspirin daily. It didn't work. The second stroke was a major one. Hospital, beeping machines, then relief. She would live. It was the left side again, but this time, worse. No movement in her left leg or arm, face pulled down on that side - at least, being the left side, there was no language loss. But she couldn't walk. Out of danger, they moved Nonna from the general hospital to Finchley Memorial Hospital, which was then devoted to recuperation and physiotherapy. And the physios set about her: exercise, effort, every day for five, six weeks. By the end of that time, there was a little improvement, but not that much, and we assembled to meet the doctor to hear what the plan was for her continuing treatment. There wasn't one. They'd done all they could. The first six weeks after stroke were crucial - after that window, there wouldn't be any further improvement. Nonna didn't speak English. The doctor told us to tell Nonna she would never walk again. As he got up to leave, he told us to set about arranging moving her into a nursing home. And that was it. For a year, Nonna sat in the lounge in the nursing home, watching television she didn't understand, and I'd visit her each day and talk to her - the despairing small talk of family and friends and weather that substituted for hope. According to the doctors, there wasn't any. I think it was anger, the slowly nurtured anger at helplessness and fate and God, that did it. The doctors might not want to do anything, but anything was better than this waiting room of death (the staff were lovely and caring, but that is what the place was). So what if the doctors said they wouldn't do anything. We would. We found a physiotherapist who spoke Italian, and paid for her to visit Nonna and work with her. And, you know, there was something - some small improvement. Nonna began to be able to move her left hand, and then her arm. And then the cavalry arrived, in the small, squashy shape of our first child, Theo - Nonna's great grandson. Nonna loved Theo. She brightened, she cooed, she came alive when we brought him to see her. And, when I held him, dangling, just out of reach as the physio worked on her standing and posture, Nonna pushed herself up, unthinking, focused on him and not on what she could not do, and she began, she began to stand. Nonna was going to be the first resident of the nursing home to walk out of there on her own two feet, rather than being carried out in a box. I still remember her chuckling laugh as she reached out to chaff Theo's cheek, standing and not even realising it, and wishing we had started this so much earlier. Then Nonna had a third stroke. She was reduced to a pair of wandering eyes, rolling without control, in a shell of flesh without any movement at all. She didn't walk out of the nursing home. Six months later, she went out in the box. I wish I'd read this book then, before all this happened. But it hadn't been written. Back then, the six weeks window was all there was. The brain was a hard-wired thinking machine: break it, and it stayed broke. This is the mistake of metaphor. We've learned to understand the body and the mind through our inventions: clocks and hydraulics, circuits and computers. Mechanical, fixed things. But the brain is alive; it's not caught by these metaphors. And what we see in this remarkable book is the dawning realisation among researchers and doctors that brain and body, mind and effort are all intimately, and directly, connected. Unlike an electronic circuit, the brain can find new connections, fresh ways of doing things, particularly when reinforcing the new connections with physical learning. This is the judgement that condemned Nonna after six weeks; this is the end of hope and the acceptance of the TV lounge; this is morally stupid and intellectually offensive. Why should hope and effort be placed in opposition to care and medicine? Only in the judgement of the reviewer. For myself, I wish this book had been written then. Maybe Nonna would still have left the nursing home in a box, but the stay would have been a battle, and not a defeat. The information Doidge provides on the brain's ability to heal itself, and thereby the body, is both fascinating and compelling. This flies in the face of our current mainstream view of the damage from brain injuries and certain chronic illnesses being permanent, with no hope of recovery. Our brains are far more resilient than science has, so far, understood. That being said, I have some problems with the overall structure and content. The important nuggets of information often get lost within re The information Doidge provides on the brain's ability to heal itself, and thereby the body, is both fascinating and compelling. This flies in the face of our current mainstream view of the damage from brain injuries and certain chronic illnesses being permanent, with no hope of recovery. Our brains are far more resilient than science has, so far, understood. That being said, I have some problems with the overall structure and content. The important nuggets of information often get lost within repetitive information and long-winded stories. Consequently, I'm not sure this book will go over well with readers looking for a more science-based read. The book opens with a case study of a man with Parkinson's disease. This is quite a lengthy section, as we follow this one man throughout his life, his disease, his determination to heal himself, his setbacks, and his healing. We're given a lot of personal information, far more than necessary for me. This section has the feel of a memoir or biography, more so than a book on brain science. There is also a lengthy section on Moshe Feldenkrais. While interesting, this feels far more like a history lesson. We follow him from Nazi-occupied Paris. We learn about his work with Irene Joliot-Curie, the famous Madame Curie's daughter. We learn about Feldenkrais's work, while also learning about how the State of Israel was formed. All of this feels like it belongs in a different book. Finally, while I appreciate Doidge's enthusiasm, I'm troubled by the fact that each case cited here had near miraculous results. Were there any patients who simply did not do well, or even as well, with the treatments discussed? I do think there is important information to gain here on the brain's healing ability, making this book worth reading. You follow specific people with the above health problems. Each is detailed and specific. Through these examples you lean of today’s cutting edge techniques. These people have what seem to be incurable, absolutely hopeless problems. Any adult of some age will be made uncomfortable following these individuals, regardless of the fact that their progress is utterly amazing. It isn't hard to imagine that such could happen to yourself. It is nice that the book focuses upon the most hopeful advances in our imminent future at the end of the book. It leaves you hopeful rather than depressed. Seriously, it is important to read this book so you know of alternative methods that are being developed. The methods are holistic. Treatments shy away from medicines when possible. It is interesting to see how ancient Eastern treatments are being woven into new treatments and are validated by testing. The techniques are clearly described, BUT one gets to a point where so much is thrown at you that you need to reread and absorb before you go on. I found myself following the text and even if I "understood", I would ask myself how exactly is that possible? The results are so astounding you step back and have a hard time believing. Even if it all makes sense. The section at the end on music therapy and the "electronic ear device" became diffuse in my head. Doctors’ names are clearly stated. Also where they work. More information is said to be available at the author's home page: http://www.normandoidge.com/ I plan on seeking further information. The audiobook is wonderfully narrated by George Newbern. Slowly and clearly. Even the appendices are read. They are also available as PDFs with the audiobook. However it is hard in an audiobook to backtrack to a particular chapter. Often it will be said, "as presented in chapter X." Going back to that is not easy. For this reason alone, I recommend the paper book. There are some absolutely wonderful things ahead to be further investigated. If you run into any of the above problems do check out this book. The next problem is finding someone who can help you. That could be difficult. This is cutting-edge technology. It's not that long ago that the idea of neuroplasticity was seen as fringe fantasy, though it is now widely accepted (though like climate change, it has its sceptics). In his second book on the subject, Doidge covers several techniques that are being used to change neural pathways to manage pain, recover lost movement, reduce symptoms of Parkinson's and other conditions. One of his main messages is that the body and the mind (brain) can't be seen as separate, the two work together in infinite fee It's not that long ago that the idea of neuroplasticity was seen as fringe fantasy, though it is now widely accepted (though like climate change, it has its sceptics). In his second book on the subject, Doidge covers several techniques that are being used to change neural pathways to manage pain, recover lost movement, reduce symptoms of Parkinson's and other conditions. One of his main messages is that the body and the mind (brain) can't be seen as separate, the two work together in infinite feedback loops (my image, not his). He wants to reach a wide audience, which no doubt accounts for the great weight of case studies over theory. If you want the theory, you have to dig for it, and follow through in the journal literature if you want more. For our book club, the balance was pretty well right, given our diverse backgrounds. Between us we were familiar with the power of focused meditation, visualisation, mindful exercise, music therapy and Feldenkrais awareness through movement techniques. None of us knew of the tongue stimulation techniques used by one practice in the US, which seems to have been very successful for those with the commitment to persist with exercises. I learned from that chapter that neck injury can affect the brain; and that repeated injury can mean you lose what you recovered and have to start rehab again. Doidge has helped me understand the dysfunctional loops of chronic pain following neck injury (I've had multiples) and I've begun to combine several of the techniques he discusses to help me manage muscle cramps, pain and improve my sleep. I've been going to Feldenkrais classes for several years; know enough to be able to focus on specific muscle groups and work on them. I now combine it with music (Mozart is recommended) and visualisation as I go to bed, and for the last two weeks I've slept better than I have for a long time. It's having other benefits as well, as I get better at managing my brain activity. Hooray! . This book was more disappointing than I think I can possibly convey. The Brain That Changes Itself was one of my favourite books and I have recommended it to all my friends, so I was very excited about reading the sequel. In this book Norman Doidge basically does the same as the first book, he gives examples of people with very serious illnesses who have had amazing cures. However for this book he has abandoned the scientific and fully embraced the pseudoscientific. I am certainly not an expert This book was more disappointing than I think I can possibly convey. The Brain That Changes Itself was one of my favourite books and I have recommended it to all my friends, so I was very excited about reading the sequel. In this book Norman Doidge basically does the same as the first book, he gives examples of people with very serious illnesses who have had amazing cures. However for this book he has abandoned the scientific and fully embraced the pseudoscientific. I am certainly not an expert on anything to do with the human body but I started to get skeptical once he basically wrote that 'sunlight is good so lasers must be better'. He thens proceeds to give a list of things that low level skin laser treatment can heal and it reads exactly like the worst pseudoscientific garbage. Essentially he says it is a miracle cure for everything from depression to cancer. I was still willing to give him the benefit of the doubt so I read as many medical papers on laser treatment as I could find and they all bore out my suspicions. Laser treatment has little, if any benefit over a placebo. This then followed for every single example for the rest of the book, with the worst example being the exercises that can improve eyesight. From my research, this has been debunked for decades and can be actually damaging to your eyes! Using one miraculous cure as an example of how well a treatment works is certainly not a good scientific method. "Guérir grâce à la neuroplasticité" est une remarquable œuvre de vulgarisation. Le psychiatre torontois Norman Doidge explique comment au cours du vingtième siècle le travail de multiples rechercheurs (Michael Merzernich, William James, Santiago Ramón y Cajal, V.S. Ramachandran, Erich Kandel, Karl Lashley, Paul Bach-y-Rita, Marian Diamond et d'autres) a réussi à démontrer que le cerveau humain est neuroplastique; c'est-à-dire que le cerveau peut s'adapter, changer sa structure et relocaliser des "Guérir grâce à la neuroplasticité" est une remarquable œuvre de vulgarisation. Le psychiatre torontois Norman Doidge explique comment au cours du vingtième siècle le travail de multiples rechercheurs (Michael Merzernich, William James, Santiago Ramón y Cajal, V.S. Ramachandran, Erich Kandel, Karl Lashley, Paul Bach-y-Rita, Marian Diamond et d'autres) a réussi à démontrer que le cerveau humain est neuroplastique; c'est-à-dire que le cerveau peut s'adapter, changer sa structure et relocaliser des fonctions quand des blessures ou des accidents arrivent. Le fait de comprendre que le cerveau est plastique est en train de causer une révolution dans le traitement de crises cérébrales, la sclérose en plaques, la surdité, les déficiences visuelles, la dyslexie, le TDA (trouble déficitaire de l'attention), la douleur, et des blessures traumatiques du cerveau. Le but du docteur Doidge est d'expliquer le phénomène de la neuroplasticité au grand public. C'est un véritable bijou pour quelqu'un comme moi qui n'a pas étudié les sciences depuis quarante ans. La valeur du livre sera sans doute moindre pour ceux qui ont récemment suivi des cours de science au niveau universitaire. When I expressed interest in understanding more about the neurobiology of mental health, a psychologist friend recommended The Brain That Changes Itself: Stories of Personal Triumph from the Frontiers of Brain Science. When I looked up that book, I found this more recent book by the same author, so started with this first. Did you know scientists didn't fully appreciate the plasticity of the brain until 2000? That wasn't so long ago, and we are on a steep learning curve to understand how the brain can grow and change like any other organ. In Physician Hurt, Then Heal Thyself, physician Michael Moskowitz suffered from debilitating chronic pain. If you've ever had chronic pain, you know how hopeless and irritable you feel. But instead of resting and bemoaning his pain, he found a way to stop it. He learned about the brain areas that light up when damaged neurons send false alarms (as with chronic pain). Knowing "neurons that fire together, wire together", with chronic pain the cells in the pain system begin to fire more easily, and the pain maps enlarge their receptive field due to the damaged neurons. The more often Moskowitz felt twinges of neck pain, the more easily his brain's neurons recognized it, and the more intense it got. The name for this process is wind-up pain, because the more the receptors in the pain system fire, the more sensitive they become. Moskowitz also knew that "neurons that fire apart wire apart". Could he start to weaken links that had formed in his pain maps? What if, when he was in pain, he could try to override the natural tendency to retreat, lie down, rest, stop thinking, and nurse himself? The brain needed a counter-stimulation. He decided to rewire his brain by visualizing the involved brain areas shrinking every time he felt pain. By six weeks, his pain was severely diminished, and by one year, it was gone. A Man Walks Off His Parkinsonian Symptoms demonstrates the magical effects of exercise on the brain. John Pepper is a South African man who reversed Parkinson's Disease through walking. There are also chapters on treating ADHD with music, blindness with eye exercises, and multiple sclerosis with a device that stimulates the tongue and therefore the brain. The writing style is engaging. Quite an interesting read! The Brain’s Way of Healing is the sequel to Doidge’s earlier introduction to the science of neuroplasticity, The Brain That Changes Itself. While that book took a more general look at the subject, this book hones in on the specific ways that harnessing the brain’s ability to rewire itself can result in remarkable recoveries from stroke and other traumatic brain injury, and halt or slow the progression of diseases like Parkinson’s and MS. This is some of the most exciting science of the twenty-fi The Brain’s Way of Healing is the sequel to Doidge’s earlier introduction to the science of neuroplasticity, The Brain That Changes Itself. While that book took a more general look at the subject, this book hones in on the specific ways that harnessing the brain’s ability to rewire itself can result in remarkable recoveries from stroke and other traumatic brain injury, and halt or slow the progression of diseases like Parkinson’s and MS. This is some of the most exciting science of the twenty-first century, and Doidge does an amazing job of making it accessible to the average reader without dumbing it down. If you own a brain, you need to read this book. Anecdotal and ignorant of scientific method. I found it hard to credit anything Doidge wrote after his random prattling about the action of laser light inside cells. This is not Oliver Sacks style "here is an interesting case and this is what it might tell us about how things might work" or "here are some new developments being trialled" it is a string of "Bob had a brain problem, by application of X he got better!" type stories where X varies from exercise to mindfulness to lasers. Quackery for Anecdotal and ignorant of scientific method. I found it hard to credit anything Doidge wrote after his random prattling about the action of laser light inside cells. Quackery for those desperate to believe in miracle cures. Sad, because the area of brain plasticity is very interesting while cherry picked anecdotes in isolation are not. especially if you have any disability, cognitive issues, adhd, dyslexia, blindness, deafness, tbi, ptsd etc. a lit about brain and how to train it - much better than the overreliance on psychiatric drugs. A while ago I read and reviewed this authors first book “The brain that changes itself” and found it fascinating. I deem the present book to be even more so. First we learn of the case of the psychiatrist/pain specialist Michael Moskowitz, who after a horrific accident, had chronic pain for 13 years, He got rid of the pain by visualizing that the areas of his brain producing it are shrinking, after discovering that two brain areas process both visual information and pain. The assumption is that t A while ago I read and reviewed this author´s first book “The brain that changes itself” and found it fascinating. I deem the present book to be even more so. First we learn of the case of the psychiatrist/pain specialist Michael Moskowitz, who after a horrific accident, had chronic pain for 13 years, He got rid of the pain by visualizing that the areas of his brain producing it are shrinking, after discovering that two brain areas process both visual information and pain. The assumption is that these areas cannot process pain and visualize at the same time. He teaches his patients to use the same method to dissolve their chronic pain. In fact, though, I do not see that these cases prove anything, since it is known that all visualization can work, even visualization that has nothing to do with pain. It would have been interesting if the author could also have explained to us how visualization in general works. Other scientists have found that patients can “shrink” their body image to rewire their brains. When patients with chronic hand pain looked through binoculars at their hands and thus magnified them, pain was increased; when they looked through the wrong end of the binoculars so their hands looked smaller, pain decreased. A Parkinson´s patient, John Pepper, learnt how to reverse his major symptoms and walk normally by a system he devised to exercise conscious control over his walking. He formed a Parkinson´s support group and taught hundreds of other such patients to drop their shuffling gait and move more freely and effectively. After mastering walking he began to take conscious control over his tremor. A chapter on rewiring the brain with light tells us how sunlight heals babies with jaundice. Florence Nightingale exposed her patients to as much sun as possible and thereby ensured their healing. Fred Kahn was healed of a rotator cuff injury by laser treatment (as I myself was), and began using low-intensity laser treatments to heal horrific wounds, diabetic ulcers, burns, psoriasis, black, gangrenous limbs, etc. etc. ; also rheumatoid arthritis, fibromyalgia, some psychiatric disorders, nerve injuries and traumatic brain injuries (TBI) can be healed in this way. We are told how LED lights, in the red and infrared range, which have laser-like properties, were used on eight areas of the head of a woman with disabling TBI symptoms. She couldn´t concentrate or sleep, became easily exhausted, couldn´t complete tasks and had lost her ability to speak two foreign languages. After her first treatment she slept 18 hours and began improving significantly. A Boston group has found laser treatment helpful in TBI. “Laser acupuncture” was used by placing light on acupuncture points. Lasers harmlessly and painlessly pass light energy into meridians. In China lasers are used to treat paralysis in stroke patients, resulting in significant improvements. The case of Gabrielle is described; following removal of a life-threatening brain tumour she had trouble swallowing and eating, was constantly nauseous, had balance problems and difficulty walking. People could hardly hear her speak; she used the wrong words, like “fork” instead of “knife”, and couldn´t multi-task; she had lost her short-term memory, couldn´t recognize objects and could see only what was directly in front of her; she was hypersensitive to all sounds, which seemed unbearably loud; she was chronically exhausted. Fred Kahn rewired Gabrielle´s brain with light by means of his laser treatments, and she was healed. Lasers were used successfully by Kahn and others to heal other brain problems, together with cardiovascular problems. Light therapy is also being used to improve damaged connections between neurons in Alzheimer´s. There is a great chapter on the work of Moshe Feldenkrais with healing serious brain problems through mental awareness of movement. These various healers came to their discoveries through working on and mastering their own severe health problems. A baby girl missing part of her brain, a third of her cerebellum, who could neither sit up nor crawl, and whose parents were told the best they could hope for was “profound retardation” was healed by Feldenkrais´s special techniques. He pronounced that the girl would dance at her wedding. She now has two graduate degrees from major universities, is a voracious reader, and did indeed dance at her wedding. There´s a chapter entitled “A Blind Man Learns to See” about a man called Webber who lost his sight owing to uveitis, an autoimmune disease. He was healed by doing exercises recommended by Feldenkrais which were similar to four ancient Buddhist exercises and also to Bates´ techniques. 1)	Meditate on the colour blue-black for a few hours a day. 2)	Move the eyes up, down, left and right, and around in circles, as well as on diagonals. 4)	Sun your eyes. Sit with eyes closed in the morning or late afternoon and let the warmth and light of the sun penetrate through the eye tissues ten to twenty minutes a day. Deep relaxation of the eyes is essential. We learn about an amazing device called the PoNS that healed a singer called Ron who could no longer sing because of MS, had trouble swallowing and suffered from unrelenting exhaustion. PoNS stands for Portable Neuromodulation Stimulator. You put the device in your mouth where it painlessly stimulates the tongue and its sensory receptors “with waves of gentle signals”. After thirty years of steadily worsening symptoms Ron´s improvement was rapid and vast. All his MS symptoms improved. There are 48 different kinds of sensory receptors on the tongue and these receptors pass electrical signals to nerve fibres, then on to the brain. The PoNS device sits on the front two-thirds of the tongue. After 400-600 milliseconds brain waves are stabilized and all parts of the brain start to react, firing together. The tongue stimulation activates the whole brain. While using the device the patient at the same time does an appropriate exercise. A person with difficulty walking should try to walk, then run, on a treadmill when using the PoNS. The device resets the brain. We are provided with case histories of persons with both Parkinson´s and MS who were healed by the PoNS, together with persons severely brain injured in car accidents. We hear about Tomatis´s Electronic Ear, which helped struggling singers who were not hearing high frequencies well. Once they could hear properly, they could sing properly. Tomatis trained the brain by stimulating the ear. We are given the case history of a boy born prematurely who had severe developmental problems and who was heled by using the Electronic Ear. This listening therapy is also effective against autism. It is said that the core feature of autism is an inability “to empathize and apprehend the existence of other minds”. This is not true, however. A more precise explanation is as follows: “Battered by sound, these children remain in fight-or flight and cannot turn on the social engagement system”. This is not only an amazing, enlightening book informing us of many not generally known ways of healing all sorts of severe brain problems, but the author writes in an engaging manner, including many personal details and descriptions of the various therapists and their healed clients, so we feel we know them personally. This is my first-read win. This was a great book, fascinating, learning many different ways that the brain can heal itself.A great resource book. I will be using the eye exercises to improve my eyesight & maybe get rid of my glasses. Now, I need to read The Brain That Changes Itself. Apie smegenis negali būti neįdomu, taip galvojau, ir nenusivyliau (gal vietom šiek tiek, kur gydytojo visagalybe pakvimpa). Daug visokių istorijų sergančių žmonių, bet knyga nevirsta evangelija apie stebuklingus pagijimus. Visgi išlieka apie smegenis kaip organą. Eilinį sykį paburbu, kad kai aš mokiausi neuro ir psicho fiziologijas, tokių knygų nebuvo, ir man mokytis buvo neįdomu, o prasmės nesimatė. Dabar matau, kad tikrai be reikalo. This article sums up exactly what disturbs me about this book. After hearing several of his interviews and being fascinated by their content I bought Norman Doidge's latest book. Only a few pages in I lost faith with him. Peddling false hope with dubious science and worse, encouraging irrational fears that will cause actual harm to people. So disappointing. Absolutely loved the book, its about the way the brain recovers and embarks on a journey of discovery, how a brain can recover with light and awaken damaged neural circuits, how it can turn off when pain is in the body releasing endorphin's to quell pain and the role of neurons and pain through research. a very indepth and fascinating and educational book. Definitely worth a read. I didn't manage to finish the last few chapters but the first few I read were very interesting and illuminating. The first case study involves the author following a man with Parkinson's and detailing his recovery process. We learn about "laser light healing" - a form of treatment which basically involves applying a low-level laser or light-emitting diode to the surface of the body in order to stimulate the body's cells to heal faster. The science behind this is based on Definitely worth a read. I didn't manage to finish the last few chapters but the first few I read were very interesting and illuminating. The science behind this is based on the fact that the human body contains light-receptive cells throughout (and not just in our eyes, as most of us might think) - even in internal organs which never see the light of day. The author details research findings by other scientists and researchers showing that when these cells are exposed to light, they are "triggered" into starting the healing process, thereby bringing about rapid healing. Experiments on mice showed that the control group which had not received the same targeted light exposure healed much slower, and less healing took place (measured by the size of the injury site). The author describes how several people have had success with laser light therapy, which simulates the effect of sunlight on cells by focusing a beam directly onto the subject's injury area. If the injury is on an internal organ or other internal part of the body, surgery may be required in order to allow the beam to be shone directly onto the organ itself and not just the outer (epidermal) skin covering it. Laser light therapy was effective in helping reverse cognitive decline/damage in at least 2 individuals which the book showcased. The implications of this method as a form of healing are immense, especially in diseases such as Parkinson's for which there is no known cure. Boy, when they say "remarkable" they mean remarkable. I was astounded by these recovery stories based on therapies I'd never heard of before. The book is a fascinating read, and I ended up just buying it as a reference when I got near the end of it. I found a lot of information that had potential applications for myself or my loved ones. I've been hearing references to neuroplasticity for about a year now, and this is the first book I've read about it. It does get rather in-depth in spots, alter Boy, when they say "remarkable" they mean remarkable. I was astounded by these recovery stories based on therapies I'd never heard of before. The book is a fascinating read, and I ended up just buying it as a reference when I got near the end of it. I found a lot of information that had potential applications for myself or my loved ones. I've been hearing references to neuroplasticity for about a year now, and this is the first book I've read about it. It does get rather in-depth in spots, alternating between technical details and anecdotal examples. Science is not my strongest subject, but I was still able to follow. I have two complaints. The first one is that he kept referencing his other book The Brain That Changes Itself: Stories of Personal Triumph from the Frontiers of Brain Science, which I plan to eventually read, but I didn't need to be reminded of so often. The second complaint is the animal testing that was spoken of with absolutely no empathy or apology. There has to be a better way to test a therapy than dropping a magnet on a mouse's head to simulate a brain injury, or severing a rat's spinal cord, or sewing a monkey's fingers together. That mouse one particularly, on top of being cruel, didn't even seem like it would guarantee any accuracy. I should clarify that the author wrote about this testing but wasn't the one actually performing any of these tests himself. I just didn't appreciate that it was presented so prosaically. Still a good book though, and highly recommended. Great book, fascinating, many of the stories told by the author seem like miracles or magic, as well as stunning are some of the mode used by the various experts and doctors to cure some of the problems that affect the brain or nervous system. Gran libro, affascinante, molte delle storie raccontate dall'autore sembrano dei miracoli o delle magie, come anche fantastiche sono alcune delle modalitá utilizzate dai vari esperti e medici per curare alcune problematiche che interessano il cervello o il Great book, fascinating, many of the stories told by the author seem like miracles or magic, as well as stunning are some of the mode used by the various experts and doctors to cure some of the problems that affect the brain or nervous system. Gran libro, affascinante, molte delle storie raccontate dall'autore sembrano dei miracoli o delle magie, come anche fantastiche sono alcune delle modalitá utilizzate dai vari esperti e medici per curare alcune problematiche che interessano il cervello o il sistema nervoso. Absoliučiai nerealus jausmas buvo skaityti šią knygą. Smegenų plastiškumas ir jų gebėjimų skalė man vis dar yra kažkoks kosmosas, nors Norman Diodge ir stengiasi tai aprašyti kaip galima paprasčiau. Labai rekomenduoju tiek bendram išprusimui, tiek su konkrečiomis ligomis (Parkinsonas, išsėtinė sklerozė, depresija, nuotaikų, miego, mokymosi sutrikimai ir t.t.) susidūrusiems. Neįtikėtina, kiek daug dalykų, pasirodo, pasaulis atrado ir suprato per paskutinius 60 metų! A really good exploration into various methods of healing. I found this book very interesting. I'm going to try to meditate to Gregorian chants and get back into my yoga. It inspired me to try something different. will offer hope to many who are struggling with "brain"
problems of all kinds, and leave the general reader in awe! An exciting overview of powerful new neuroscience theories that connect mind, body, and soul … Brain science offers all kinds of useful techniques to care for our infinitely complex selves. A Michelin Guide to this hopeful new trove of knowledge and insight. Doidge explains the processes of the brain and body in a clear and understandable way, even to those of us who previously couldn’t distinguish a hippocampus from a hippopotamus. He tells of patients who hobble into labs and medi An exciting overview of powerful new neuroscience theories that connect mind, body, and soul … Brain science offers all kinds of useful techniques to care for our infinitely complex selves. A Michelin Guide to this hopeful new trove of knowledge and insight. Doidge explains the processes of the brain and body in a clear and understandable way, even to those of us who previously couldn’t distinguish a hippocampus from a hippopotamus. He tells of patients who hobble into labs and medical offices on canes and leave without them after their first visit. His enthusiasm for these recoveries is no less than that of a faith healer who has just brought sight to the blind … For someone who suffers — or knows someone who suffers — from an injury or illness related to the brain, both this book as well as Doidge’s previous will provide information — and perhaps hope — that the brain can heal itself. A dazzling collection of stories about neuroplasticity and the ever-changing brain … cutting-edge treatments that use the body's senses to access, and improve, neurological functioning. In friendly vignettes reminiscent of Oliver Sacks’ case studies, Doidge chronicles the heroic efforts of patients with a wide variety of apparently intractable ailments, from chronic pain to multiple sclerosis … Doidge truly takes a holistic approach to his subjects, getting to know them and their doctors and sharing every detail with his readers … Each of Doidge’s examples suggests tangible treatment ideas for patients who may have thought they were out of options. Doidge’s penchant for considering unconventional approaches to healing offers hope for all. Exhilarating science … In an era of ever-increasing medicalisation of the human mind, and the medication of it, the appeal of neuroplasticity outlined by Doidge is addictive. It is inspiring, page-turning stuff. A lively, anecdotal account of potential new directions that may point the way to major therapeutic breakthroughs. A fine blend between scientific substance and literary style. While never dumbing down the science, he’s positively elegant in his crystalline explanations of brain science for a lay audience. A vivid, robust and optimistic read … an essential addition to our growing understanding of the mind-brain-body connection. Doidge argues quite convincingly that when the brain is damaged or incompletely formed, whether from stroke, multiple sclerosis, traumatic brain injury, autism, ADHD or a host of other conditions, it's entirely possible to ‘rewire’ the circuits by training a different part of the brain to take over the task … Doidge has an uncanny knack for addressing questions just as they arise in the reader's mind … An award-winning literary writer and journalist as well as a psychiatrist, Doidge has achieved a fine blend here between scientific substance and literary style. While never dumbing down the science, he's positively elegant in his crystalline explanations of brain science for a lay audience. 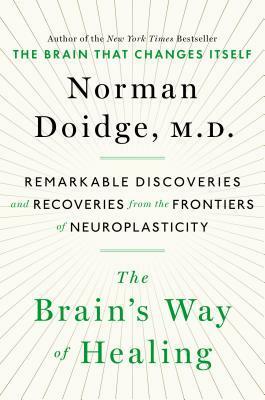 In his new book, Doidge again scouts the frontiers of neuroplasticity to bring tidings of the next-generation therapies that promise to stimulate and harness the brain’s regenerative capacity — Doidge is an ardent herald of the new science. This is a book of miracles. Fascinating … An absorbing compendium of unlikely recoveries from physical and mental ailments offers evidence that the brain can heal. Beautifully written … inspiring … By merging scientific information into timeless and fascinating personal stories, Doidge makes his discoveries extremely readable … In some cases, the results are completely astounding and unexpected …The Brain's Way of Healing grabs onto the reader at once and compels them to keep reading. This is an important and encouraging book. Reviewers hailed Norman Doidge’s 2007 The Brain That Changes Itself as a book that showed its author’s rare talent to explain science to the rest of us: “You don't have to be a brain surgeon to read it — just a person with a curious mind.” Now the physician who was then paired with Oliver Sacks and Stephen Jay Gould returns with a captivating new tome about neuroplasticity, the brain’s astonishing capacity to repair itself after injury or illness. Dr Doidge’s clear descriptions of exciting breakthrough brain research will give readers a heartening new sense of the dynamism of the body we live with daily. Doidge is the master of explaining how the brain’s plasticity can be harnessed to improve the symptoms of brain-related disorders, ranging from stroke to autism. Doidge is persuasive and curious as a writer, and rigorous as a thinker, though what he writes about is at the edge of our current understanding of mind and body. [Doidge] writes in an urgent, enthusiastic voice … He couples anecdote with science: describing patients and scientists with respect and warmth, explaining complex neuroscientific theories clearly and in great detail. [E]xplores the phenomenon of neuroplasticity — the discovery that the brain can change its own structure and function in response to mental experience. This is regarded as the most important change in our understanding of the brain and mind since the beginning of modern science … Doidge shows how the amazing process of neuroplastic healing really works. The preface promises miracles... but there sure isn't a lot of primary literature cited. >_< so disappointed this seems to be a bunch of pseudoscience... I can't bring myself to read it fully after skimming the references. Naturopaths? Osteopaths? Chiropractors? Seriously?? If this book wasn't claiming to be scientifically sound, I'd be way less annoyed. Quite frankly, it's misleading people to believe a lot of these therapies are medically and scientifically sound. Doidge's first book, Th The preface promises miracles... but there sure isn't a lot of primary literature cited. >_< so disappointed this seems to be a bunch of pseudoscience... I can't bring myself to read it fully after skimming the references. Naturopaths? Osteopaths? Chiropractors? Seriously?? If this book wasn't claiming to be scientifically sound, I'd be way less annoyed. Quite frankly, it's misleading people to believe a lot of these therapies are medically and scientifically sound. Doidge's first book, The Brain that Changes Itself, inspired me to study neuroscience! I'm saddened this book appears to be quackery. Not a 'light' read and will have to revisit periodically. Some of Norman Doidge case studies seem a little flaky at first but he back everything up with science - good science! I was interested to see a fairly large section on Moshe Feldenkrais, Awareness Through Movement. I have been a long time advocate for Feldenkrais methods and this book has reinforced my understanding of the science behind them. I highly recommend this book to anyone who suffers from chronic pain, ME, Parkinsons, Multiple Not a 'light' read and will have to revisit periodically. Some of Norman Doidge case studies seem a little flaky at first but he back everything up with science - good science! I was interested to see a fairly large section on Moshe Feldenkrais, Awareness Through Movement. I have been a long time advocate for Feldenkrais methods and this book has reinforced my understanding of the science behind them. В тази книга има едно изречение, което гласи, че болката в крайна сметка е въпрос на избор и че е податлива на нашия контрол. Мисля си, че това е ужасно важно -- във всички смисли. Norman Doidge, M.D., is a psychiatrist, psychoanalyst, researcher, author, essayist and poet. He is on the Research Faculty at Columbia University’s Center for Psychoanalytic Training and Research, in New York, and the University of Toronto’s Department of Psychiatry. He is a native of Toronto.